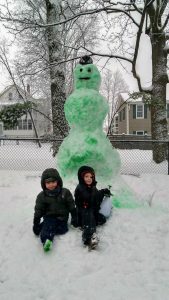 This is a blog about finding and building our kid’s personal awesome. About 5 years ago when my moments-old son R lay blue, bloody, and balled-up on a stainless counter in Germany, I silently promised that beyond my personal aspirations for him, I would help him find his own way to a fun happy life. I made that same silent promise again two years later as I held my new son M.
Last weekend, it struck me how weird my boys were becoming. Two days of rain had turned the Mt. Auburn Cemetery into a series of puddles, and we spent several hours rescuing drowning worms and splashing our way from puddle to puddle. 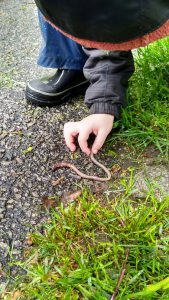 As we were loading up, R said, “It sure is great weather for saving worms!” I agreed with a smile — perspective shapes everything. I want my boys to live in a world where their ideas actively shape their reality. Bubbles can be the size of cars. Paper airplanes can fly all the way across yards with ease. Homemade pretzels don’t have a specific shape or even color. Knots are best learned by taking turns tying each other to the living room chair. This master plan is underway, and I feel like I’m on track to exposing them to skills and concepts on their lifelong walkabout to finding their own interests.